You shouldn’t fail to purchase Marshall Kilburn Portable Bluetooth Speaker if you need a pristine sound quality. The most important features to look for in any Bluetooth and the portable speaker is performance and design. You should consider this speaker as it is near-perfect. It is portable with a design for taking it from one place to the next. This is the kind of device you proudly show to your friends and boast its loud bass and connectivity strength. It can be perfect for listening to music or movie sounds when connected to other audio sources. In order to help you with finding the value of your money, we searched all the relevant information for Marshall Kilburn Portable Bluetooth. Continue reading for the details. This is one of the best sound speakers for its class. You will use it connected to you via a cable or wireless. Despite its relatively smaller size, the audio performance is incredible. It is worth spending on as you plan your next big party. We have focused on all features and performance in this Marshall Kilburn portable Bluetooth speaker review. Let’s start with the design. When you open the box, you will find a user guide and auxiliary cable right on top. When you uncover more, you will find IEC C7 power cable on the right. You will then remove your brand new Marshall speaker. Most likely, you will be impressed by the design of Marshall Kilburn. The knobs and the finish are perfect. 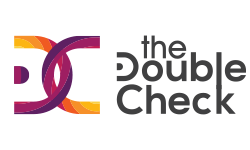 The finish can be either cream or black, but the logo remains silver. he chassis measures 5.5 x 5.5 x 9.5 inches and has two 0.75” tweeters and one 4inch woofer in it. This speaker is portable but might be a little hard to carry everywhere as it weighs 3 kg. Nevertheless, its performance is worth the sacrifice. If you ever spent your younger days playing musical instruments, you will experience those memories when you use this speaker. It contains a logo of Marshall attached on the grill which is typical for all guitar amps produced by the company. The inputs and the controls on the top of the speaker are metal finished. They are excellent to turn around without high resistance experienced with other devices. There is a Bluetooth mode button to connect to your Bluetooth-enabled devices. The power button on the right top can be switched on or off as indicated.It has a vintage strap which makes it convenient to carry. The strap has a good feel removable when not needed. Marshall has made this speaker for places that play all kind of music for entertainment. It is designed to be easily portable to different places. When it comes to the capacity, Marshall Kilburn portable Bluetooth speaker produces a 62-20,000Hz frequency. The sound is of high quality and can be used to entertain the audience in a large room. This speaker contains a rechargeable lithium polymer battery. The manufacturer indicates that this speaker can play for 20 hours non-stop when fully charged and listening at 50% volume. When the battery is 20%, and below, the indicator starts to blink. When the battery runs low, you can charge it by plugging the power cable. Please note that Marshall Kilburn does not use a micro USB like other small speakers. However, the battery can be replaced, unlike other portable speakers. This device is free from chords and wires confines. You can connect it using an analog method or use its strong Bluetooth which works within a range of 30 feet. Gold coated double-ended coil cord which measures 3.5mm is provided. You can use it to connect your TV or PC with the speaker. Marshall Kilburn Portable speaker has a maximum sound pressure level rated as 100 dB/M. The response of the frequency of this speaker is 62 – 20000 Hz as mentioned earlier. A quality bass reflex is a guarantee. This speaker can perfect in your living room or anywhere outside your home. However, it is not suitable for use along the coastline and in harsh weather. 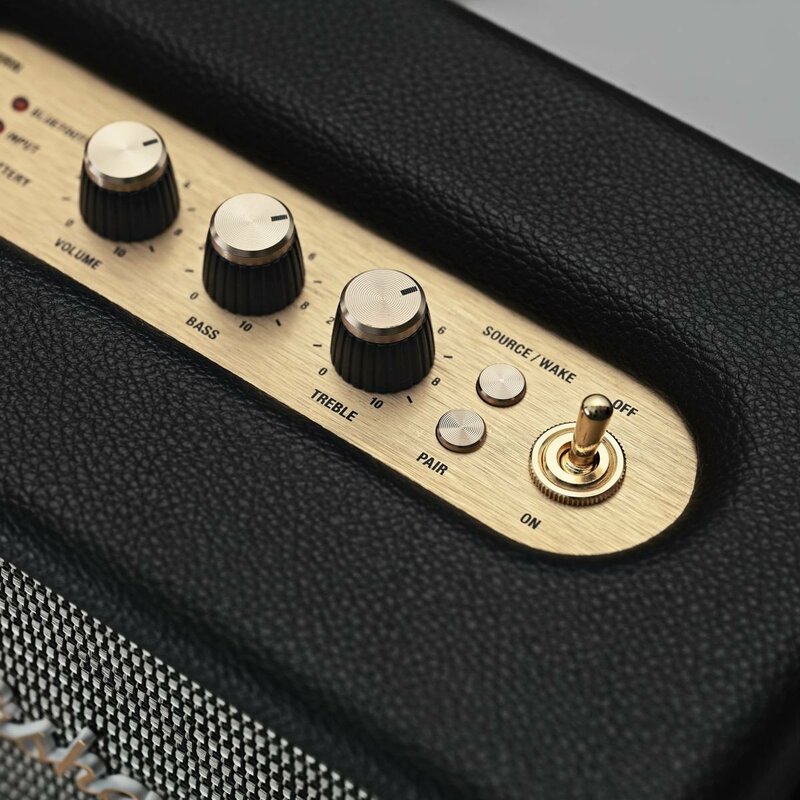 You can tailor the sound to suit your taste using the independent treble and bass controls of this Marshall Kilburn speaker. When operating at the recommended 50% bass and treble, the speaker has a strong bass and iridescent highs. The frequency response of this speaker is higher than the speakers of the same category. It has an extra low-end extension which makes the tracks with high bass twinkle with great power. You can test that by retaining your hand near the rear bass port and feel how much air is being moved. The battery life is 20 hours when fully charged and listened with reasonable volume. However, this time becomes less with time as the speaker ages. The unique thing is that you do not have to chuck the whole device when the battery is dead. 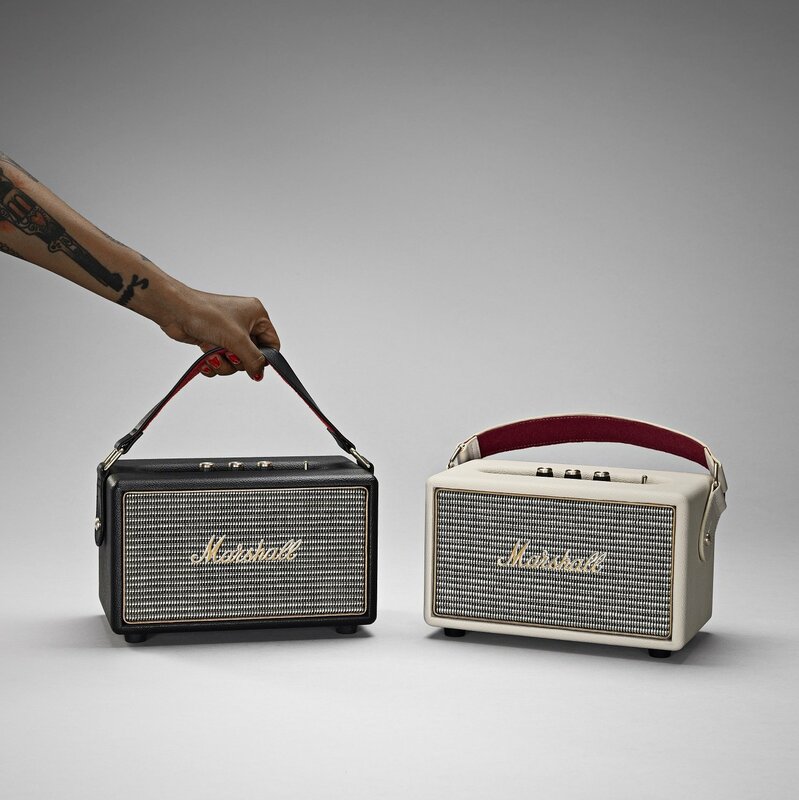 Marshall Kilburn Portable Bluetooth Speaker has a replaceable battery. This makes it outstanding amongst its competitors. On top of the speaker, there is a Bluetooth button. In order to pair it with your tablet or smartphone, turn the Bluetooth on for both the speaker and the device when you find “Kilburn” in your settings, pair and enjoy the connection. It is ideal for both Android devices and iPhones. Within a range of 30 feet, this wireless connection remains strong and stable. You can regulate the bass, volume level, and treble through the top knobs. The overall set up and use of this device is simple and can be easier by reading the manual provided. 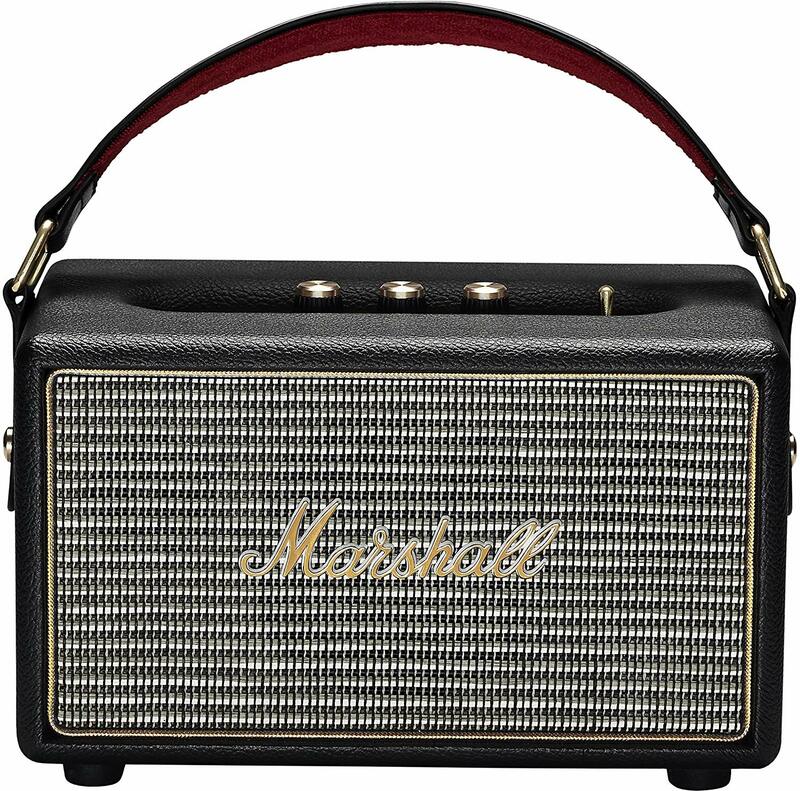 Marshall Kilburn Portable Bluetooth Speaker has a great design of simplicity and vintage sections. It gives high-quality sound even in large rooms compared to its competitors. The fact that its battery lasts longer and can be replaced sounds like the best choice if you are looking for a portable Bluetooth speaker. 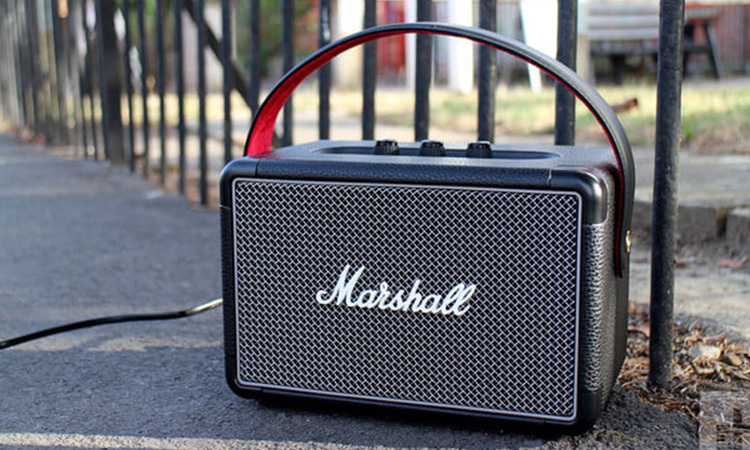 The general, features and performance are bizarre as discussed in this Marshall Kilburn Portable Bluetooth Speaker review.